Species: Human Goddess, but she can turn to other forms, like to a Sea Dragon and a Mermaid. Glorious is a tall and lean woman, with long hair that can change to colors only of the sea, like green, blue, and sometimes purple or pink and orange like the color inside of seashells or coral. Her hair sometimes has the tiniest of seashells and flowers neatly twirled in strands of her hair. Glorious is beautiful. Look at the picture for her normal apparel. She is barefooted most times. 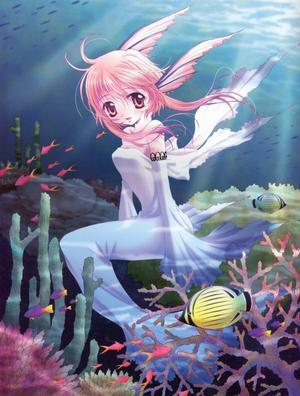 In her mermaid form, her tail is sky-blue, but has a pink shine to it. Her sea dragon form, she is a long Chinese-like dragon with dark blue scales and golden eyes. She is 50 ft. in this form. 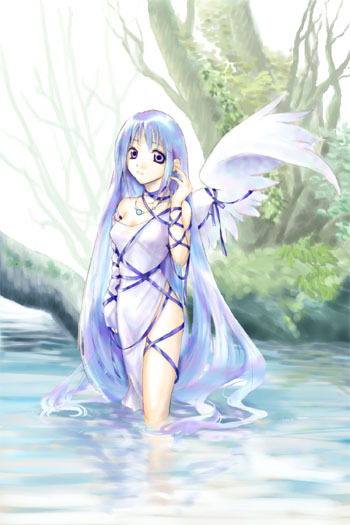 Being Goddess of Water, she has blue and green auras of many shades embracing her, but they are barely noticable. Glorious is a cheerful, bubbly, and happy-go-lucky girl. She loves to play games, but is serious when she needs to. She is slow to anger, but a way to get her attention really quick is to insult her kingdom, friends, and anything she loves, especially her hair. She loves to make friends, and is never mean to anyone, even if they hate her. She never hates anything, or tries not to. She loves peace and serenity, and does her best to make it last. Inamorato/Inamorata: IDK what this is, but I'll just say no. Relations: Her mother was a mermaid, and her father was a human. She is an only child. Staying away from water for a long time... It will drive her slowly to insanity. Betrayal from a loved one... She will never be the same again. Death of a loved one... She will not be focused on anything for a time.